Availability of water is fundamental for development in the East African region. However, this vital resource is already under stress from land degradation, pollution, and overfishing. 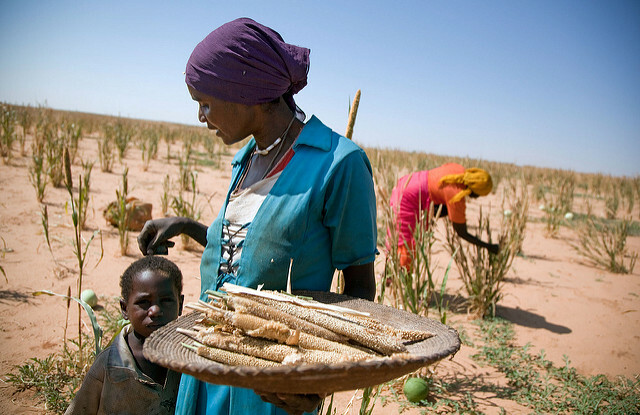 Climate change adds to these problems, greatly increasing the vulnerability of the poorest people in the region. HyCRISTAL is developing a new understanding of climate change and its impacts in the region, working with decision-makers to manage water for a more climate-resilient future. HyCRISTAL focuses on East Africa; a rapidly developing region where, close to the equator, there are two rainy seasons per year, but includes areas which have a single dominant rainy season. The socio-economic focus region is the area of the East African Community states (Burundi, Kenya, Rwanda, Tanzania and Uganda), but the project addresses a wider region including Somalia and Ethiopia. 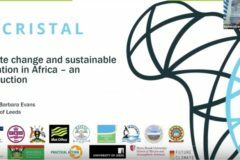 HyCRISTAL is supported by the East African Community and is linked to the World Meterological Office GWEX programme project HyVic. Improve critical knowledge of water availability as well as current and future risks from high-impact hydrological events based on the new understanding of future climate. Translate scientific understanding into appropriate water management and livelihood planning tools to enable decision-makers to assess the risk to infrastructure and livelihoods from climate change and to support the development of adaptation strategies. Evaluate new tools and integrated governance mechanisms in pilots, developing livelihood benefits within targeted urban and rural communities. Deliver a comprehensive dissemination and knowledge-sharing campaign to share evidence and tools with local decision-makers through to national and regional policy-makers. 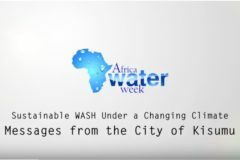 HyCRISTAL will improve our understanding of key climate-water processes in the East Africa region in partnership with a wide range of stakeholders to apply this knowledge in two different settings: rural communities that rely on agriculture and fishing; and urban populations where water supply and sanitation are under pressure. Sub-projects address tea production (CI4Tea and HyTea), with the linked HyTpp project addressing Lake Victoria levels for the transport sector. 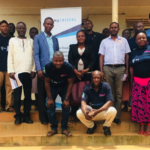 By developing climate science and helping water users assess their vulnerabilities; the HyCRISTAL project will increase the resilience of communities in East Africa. This will include the production of new, accessible, understandable and easy to- use tools for water resource management in a changing climate. The methods and tools developed will then be applied to decision-making processes. Working with policymakers, inter-disciplinary research (hydrology, economics, engineering, social science, ecology and decision-making) is quantifying risks and providing the necessary tools to use climate change information for decision making on a 5-40 year timescale. 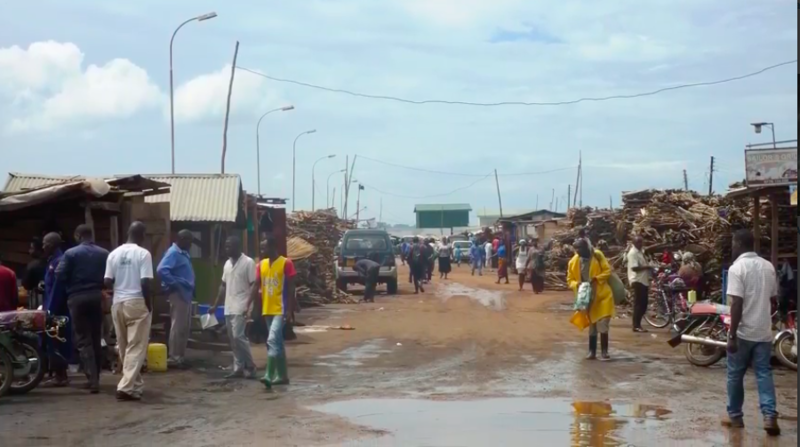 Making critical water and public health infrastructure more climate-resilient in Kampala, Uganda and Kisumu, Kenya. Knowledge Exchanges to open pathways to research-informed decision-making for rural livelihoods, including fisheries. Pilots in two Lake Victoria regions: Mukono, Uganda and Homa Bay, Kenya, to capture two different national governance and policy regimes. Water management (river basin planning, including irrigation) within the Ugandan Water Management Zones. Tea production and climate change mitigation strategies in Kenya. Lake Victoria lake levels and transport infrastructure and planning (through the HyTpp project). 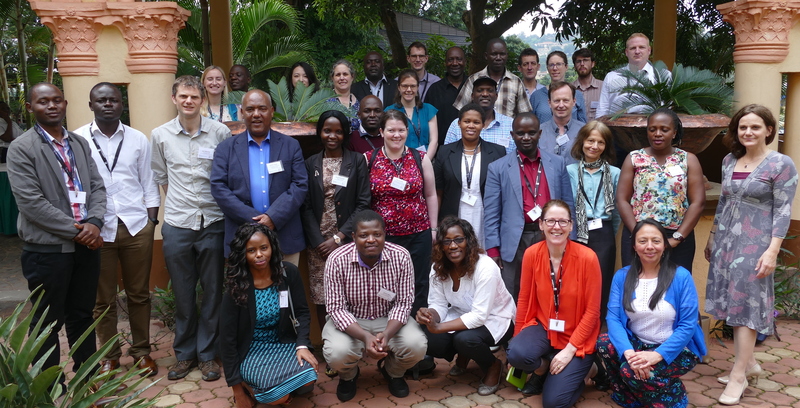 Beyond these specific locations and pilots, the HyCRISTAL project seeks to increase awareness and use of relevant climate information in policy across East Africa and anticipates that its research will be applicable to many other climate-sensitive decisions across a variety of sectors. Climate projections show a warming trend in East Africa in the decades ahead, but changes in rainfall are more uncertain. Changes in weather extremes are expected, although the likely magnitudes of these are currently unclear. HyCRISTAL aims to tackle current uncertainties that exist around climate change projections for the region, concentrating in particular on what they mean for the availability and management of water. HyCRISTAL is working with the region’s decision-makers to integrate this information into current long-term planning and decision-making. HyCRISTAL works with users to deliver world-leading climate research quantifying uncertainty from natural variability, uncertainty from climate forcings including those previously unassessed, and uncertainty in response to these forcings; including uncertainties from key processes such as convection and land-atmosphere coupling that are misrepresented in global models. Research is delivering a new understanding of the mechanisms that drive the uncertainty in projections. HyCRISTAL will use this information to understand trends and provide a process-based expert judgement on projections. The work involves improving the understanding of key climate-water processes in the region, and working in partnership with climate-impacts scientists, practitioners and a wide range of stakeholders to apply this knowledge to decision making. Dr. John Marsham is a Water@Leeds research fellow within NCAS-Weather. He leads a group studying atmospheric convection, tropical meteorology, and Saharan dust uplift. He focuses on taking process studies through to implications for and improvements in weather and climate models. In 2009 he was awarded the Royal Meteorological Society’s L F Richardson prize, in 2010 the European Meteorological Society’s Young Scientist Award for his “outstanding publications”. John holds an MSc. in Physics and a Ph.D. in Meteorology, University of Edinburgh. Gabriela is HyCRISTAL Project Manager and water@leeds Coordinator. 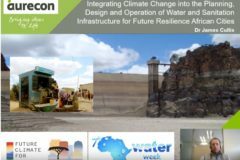 She facilitates the development of multidisciplinary partnerships involving academics and government agencies, NGOs and SME’s to find solutions for water-related issues. She has an MSc. in Rural Development and Natural Resources from ECOSUR (Mexico) and a Ph.D. in Plant Ecophysiology from the University of Sheffield (UK). Her research interests include natural resources management, research network facilitation, climate change, tropical forests, ecoinformatics and data-driven decision making. Andrew is a lecturer in International Rural Development at the School of Agriculture, Policy and Development, University of Reading. His research interests include system-wide drivers of agrarian change and ecosystem resilience; governance, including the role of ‘traditional’ institutions in managing land, livestock and environmental resources. Andrew obtained BSocSc. (Honours) and an MSocS from Rhodes University, South Africa. Andrew has a Ph.D. in Social Anthropology from University College London. Richard is currently Associate Professor within the Department of Natural Resources and the Environment at the University of Connecticut. Richard’s research include but are not limited to regional climate dynamics, coupled regional climate-hydrologic modelling, regional climate change impacts and vulnerability assessments and climate-human-ecosystem interactions. Richard has Bachelor degree in Meteorology from the University of Nairobi and a Ph.D. in Atmospheric Sciences from North Carolina State University. Matthew Ascott is a hydrogeologist at the British Geological Survey. Matthew studies the impacts of environmental change of water resources and macronutrient cycles in groundwater-surface water systems. His current research focuses on quantifying the impacts of climate change on public groundwater supplies in both Africa and the United Kingdom. Matthew is a fellow of the Geological Society of London and has an MSc. 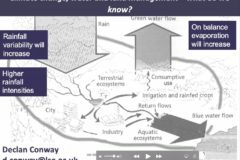 in Hydrogeology from the University of Birmingham. Emily is a core member of NCAS-Climate staff within the land-surface group. Emily’s work focuses on variability and change in the hydrological cycle, and the way that people perceive and experience the associated hazards. She has strong interests in African rainfall, and leads the Tropical Applications of Meteorology using SATellite (TAMSAT) programme. TAMSAT provides a real-time rainfall product to stakeholders in Africa. Emily received her Ph.D. from Oxford University. Ben is a climate scientist at the UK’s Met Office. A big part of his work involves trying to quantify the plausible spread of future changes that are consistent with the current knowledge of climate processes. Dai is a specialist in big data, database and data modelling. He has 30-plus years experience in the computer industry, in public and private sector companies, consulting, teaching and developing software products, and as part of management teams shaping the direction of innovative data start-ups. Dai is a published author of texts on software project management, an international speaker at technology conferences and a guest lecturer at British universities. He has a BSc. in Mathematics from the University of Birmingham and an MSc. in Computer Science from the University of London. Andrew is Programme Coordinator at Practical Action. He has over 20 years experience establishing and managing international development interventions. Andrew provides technical and advisory support on strategic planning, systems approaches and organisational effectiveness to regional offices and national thematic programmes, with a focus on climate-smart agriculture and resilience to floods and drought. Andrew is currently studying towards his MSc. in Leadership and Innovation at the University of Dundee. Rosalind’s research interests include: African weather, Africa and climate change, climate modelling, knowledge exchange and methods, governance and decision-making expertise, facilitating entrepreneurial ground-based activities to broker dialogue communication between climate scientists, humanitarian and development practitioners and policy makers in Africa. Rosalind holds a Ph.D. in Meteorology, University of Reading and joined Reading’s Department of Meteorology as a Post-Doctoral Researcher in 2005. Giovanna is a development economist lecturing in the School of Development and Strategic Studies in Maseno University, Kenya. She has research expertise in the fields of micro-entrepreneurship and work-related decisions, adoption of climate change mitigation (agroforestry) and adaptation strategies, individual decision-making processes and the role of formal and informal institutions (primarily gender norms), and psychological traits (primarily risk attitudes). She has an MSc. in International Development and a Ph.D. in Development Economics from the University of Reading. Marie-Estelle is a senior research scientist at the National Centre for Atmospheric Science (NCAS)-Climate at Reading University. Her research interests include high-resolution global climate modelling, Global energy and hydrological cycles as well as Land surface-atmosphere interactions. Caroline is a Ph.D. student at the University of Reading, working with Dr. Emily Black and Professor Richard Allan. Her Ph.D. work looks at the seasonality of precipitation over Africa, including the representation of the seasonal cycle of precipitation in CMIP5 models, and future projections of seasonality. She will be joining HyCRISTAL in May 2018 as a post-doctoral research scientist. Dr. Jackson Efitre holds a Ph.D. in Fisheries and Aquatic Sciences, and Certificates in Water and Natural Resources Management and Geographic Information Systems. He is interested in examining the effect of human activities such as deforestation, over-exploitation, pollution, habitat degradation and climate change on fisheries resources in natural water bodies and in the development of sustainable management strategies for these resources. Barbara holds the chair in Public Health Engineering in the School of Civil Engineering, University of Leeds. Barbara is also a Chartered Engineer (CEng). Her research activities centre around sanitation, hygiene and water services in the global south. Professor Evans’ research includes sanitation in low-income urban communities, rural sanitation, and water/sanitation in cities and towns. Barbara has a BEng. (Hons) in Civil Engineering, Leeds University and an MSc. in Development Studies, London School of Economics. Jonathan is a specialist in instrument development, installation and application of water quality and micro-meteorological systems. He worked to develop the Mk4 Hydra, a low-power, integrated open-path carbon dioxide and water vapour eddy-correlation system. He was involved in the field support and training for the Carbonsink project, measuring the carbon cycle in the Brazilian rainforest, measuring carbon dioxide, latent and sensible heat fluxes using the eddy correlation technique and micrometeorological and hydrological measurements. He has a Ph.D. from Reading University. Declan is a post-doctoral researcher within the Institute for Climate and Atmospheric Sciences (ICAS) at the University of Leeds. Within the HyCRISTAL project, he is investigating moist convective processes in East Africa using a convection-permitting model. This work should improve our understanding of uncertainties in climate projections for the region. Declan undertook his Ph.D. with the University of Edinburgh investigating the global representation of lightning in models, the impact of lightning on atmospheric chemistry, and the potential changes in lightning as a consequence of climate change. Elizabeth is a climate scientist working at the Met Office on extreme rainfall processes and their evaluation in models across space and time scales. Her work links up Met Office expertise in forecasting extreme events on weather and climate change timescales and exploits the seamless nature of the Unified Model. Elizabeth studied Natural Sciences (Physics) at Cambridge University and has an MSc. in Pollution and Environmental Control from Manchester University and a Ph.D. from Imperial College London. Ann is a Senior Research Fellow at the African Centre for Technology Studies (ACTS), a knowledge think tank based in Nairobi Kenya. She is also a visiting researcher at the Development Policy and Practice (DPP) unit, Open University, UK. Dr. Kingiri holds a Ph.D. in Development Policy and Practice from Open University, UK, an MSc. in Biosafety in Plant Biotechnology form Mache Polytechnic University, Ancona, Italy; an MSc. in Plant Pathology and a BSc. in Agriculture, both from the University of Nairobi. Jesse is a graduate of BSc. in Meteorology and an early career researcher in the Department of Geography, Geo-informatics and Climatic Sciences, Makerere University. 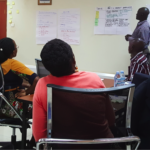 He has undertaken research on evaluation of the performance of CORDEX models over Uganda. He is interested in expanding this work to a larger eastern Africa domain using CMIP5 simulations. This will contribute to Pillar 1 WP 2.3 assessment of the HyCRISTAL project. Alfred Kondowe is a meteorologist currently working at Tanzania Meteorological Agency Numerical Weather Prediction Section. He graduated holding a Ph.D. from Russian State Hydrometeorological University in 2012. His research focused on the improvement of the WRF-ARW model forecast of meteorological variables over Tanzania. Daniel is a hydrogeochemist at the British Geological Survey. His research spans biogeochemical processes in floodplains, field sensors and isotope techniques for tracking pollution, microbiological contamination in drinking water sources, urban groundwater quality and use, water resources in Africa and Asia, water quality, vulnerability and impact of climate variability. Daniel is a Member of RSC Water Science Forum and the International Association of Hydrogeologists. He is also a Chartered Chemist, RSC. Kamazima is an Associate Professor in Marine Physics at Stonybrook University. He studies ocean processes that affect transport (e.g. currents and tides) and density distribution (e.g. mixing and heat balance). His research interests are the structure and dynamics of the shelf-seas, remote sensing oceanography and biological-physical interactions, which affect larval transport. He is also faculty director of the Environmental Living Learning Centre. He holds a Ph.D. from the University of Wales. David is a hydrogeologist at the British Geological Survey. David’s research interests include groundwater flooding, groundwater policy and management, groundwater resource assessment and raising awareness of groundwater issues. David holds a BSc. in Geophysics from the University of Edinburgh as well as an MSc. in Water Resource Systems Engineering from the University of Newcastle. Ross is a post-doctoral research scientist at the University of Reading. His main research interests include satellite rainfall estimation and improving the characterisation and understanding of African climate variability and change. He is a member of the TAMSAT Group who provide pan-African satellite rainfall estimates to various stakeholders. He obtained his Ph.D. from the University of Reading. Benson Mbani is currently a tutorial fellow at Jomo Kenyatta University of Agriculture and Technology (JKUAT) having recently completed an MSc. in Geospatial Information Science and Remote Sensing (MSc. GIS and R/S). He also holds a first degree in Geomatic Engineering and Geospatial Information Systems from the same University. His research interests are in the fields of Artificial Intelligence for GIS, Satellite Image Analysis, Geostatistics, GIS Programming, Automation and Open Web Mapping. Felix is a lecturer at Jomo Kenyatta University of Agriculture and Technology in Nairobi, Kenya. His expertise in GIS and Remote Sensing, Database development, Climate Modelling, Climate Change, Survey and mapping and Environmental Impact Assessment. He has an MSc. in Environmental Information Systems from Jomo Kenyatta University and a Ph.D. in Civil Engineering from the University of Tokyo, his research focused on Integrated Climate Change Impact Assessment and Extreme Event Forecasting in the Lake Victoria Basin. Dr. Mercy Mwaniki is a lecturer at Jomo Kenyatta University of Agriculture and Technology in Nairobi, Kenya. Her expertise are in GIS, Environmental Remote Sensing applied to disaster (e.g. landslides), survey and mapping and Environmental Impact Assessment. She has an MSc. in GIS and Remote Sensing from Jomo Kenyatta University of Agriculture and Technology and a Ph.D. in Physical Geography from the University of Bamberg (Germany). Her research thesis focused on modeling the impacts of predicted environmental change on the frequency and magnitude of rainfall-induced landslides in Central Kenya. Doreen Mwara is an upcoming scientist in Numerical Weather Prediction who obtained her BSc. in Meteorology at the University of Nairobi in 2014. 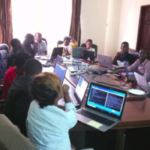 She currently works as a Meteorologist at the Tanzania Meteorological Agency where she deals with downscaling global models to limited area models for Tanzania, using COSMO and WRF-ARW models. Among her interests in research is working with high resolution global and regional models to improve our understanding of future climate. Rhoda is a graduate of BSc. in Meteorology and an early career researcher in the Department of Geography, Geoinformatics and Climatic Sciences, Makerere University. She has undertaken research on climate-smart Agriculture in Nakasongola district in Uganda. She sees potential to expand this and is interested in continuing this work by supporting the livelihood team within HyCRISTAL. She will also support Pillar 1 WP 2.3 assessment on the literature review to document findings of related studies. John Owuor is a lecturer at the School of Development and Strategic Studies (SDSS), Maseno University. He has a background in Political Science and Geography at an undergraduate level and MSc. in Development Studies from the University of Nairobi. Currently, John is a Ph.D. candidate in the Department of Development Studies at Maseno University. His area of research interest is in climate adaptation specifically assessing the influence of adaptive governance in building adaptive capacity of fishing communities in developing countries. Celia is a co-founder of Evidence for Development and has worked extensively at an international policy level on the protection of children in situations of armed conflict, and on social protection and social policy issues affecting children. Celia studied history at Oxford University and has a Ph.D. from the London School of Hygiene and Tropical Medicine. Her publications include work on famine and food security, livelihood assessment and analysis, social policy and youth justice in developing countries, and the impact of armed conflict on children. Dave’s main areas of expertise are African climate variability and change, and the mechanisms and uncertainty of future regional climate change, using both General Circulation Model (GCM) and observational data. Other research interests have included European climate change, atmospheric decadal variability, and global seasonal predictability. Dave graduated from the University of York, then completed a Ph.D. at the University of Reading in short-range rainfall forecasting over the Sahel. Geoffrey is an experienced climate scientist who recently submitted his Ph.D. Geoffrey’s research involves assessing the drivers of current climate variability and future climate change over Uganda and how the climate extremes associated with variability and change impact on banana production in Uganda. Geoffrey has a BSc. (Hons) in Mathematics and Economics from Makerere University, Uganda and a Ph.D. in Meteorology from the University of Nairobi, Kenya. Chuki Sangalubembe is a principal meteorologist currently working at Tanzania Meteorological Agency in Numerical Weather Prediction Section. He graduated with an MSc. degree in mathematical modeling in 2012 at the University of Dar Es Salaam, Tanzania. His research focused on the implementation of WRF-3DVar Data assimilation in Tanzania for the purpose of improving high-resolution regional WRF model forecast of meteorological variables over Tanzania. Claire is a senior applied climate scientist at the Met Office. Her work focuses on the generation and communication of information on climate variability and change to inform decision making on climate resilience and capacity building in developing countries. Key research interests include the generation of downscaled regional climate models over complex regions, the analysis of regional climate change projections and approaches to user/stakeholder engagement. Frederick is a Professor of Marine, Earth, and Atmospheric Sciences and of Mathematics at the North Carolina State University. He directs the Climate Modelling Laboratory at NC State; which develops innovative numerical methods for climate models and builds and applies regional coupled models for application to critical user needs in Africa and around the world. Dr. Semazzi has a Ph.D. in Meteorology from the University of Nairobi, Kenya and is a Postdoctoral Fellow, National Academy of Sciences, NASA Goddard Space Flight Centre. Kara is a post-doctoral researcher in the Climate Modelling Laboratory at North Carolina State University. She is working within the HyCRISTAL Transport Pilot Project (HyTPP) as part of a group providing an analysis of historical and potential future Lake Victoria levels which will be used as input in the World Bank considerations on a program for the rehabilitation of Lake Victoria’s ports and lake transport. Kara obtained her Ph.D. in Atmospheric Science from North Carolina State University. Grady is a Postdoctoral Research Associate at the University of Reading. His research interests include visual methods of creative inquiry, participatory approaches, critical pedagogy and theory, and subjectivity in the Anthropocene. He worked for many years as a documentary filmmaker before receiving his MSc. degree in Environmental Conservation Education from New York University, followed by his Ph.D. from the Centre for Communication and Social Change at the University of Queensland, Australia. Celia Way is a Research Fellow at the University of Leeds. Working with Barbara Evans within the Institute of Public Health and Environmental Engineering, Celia is focusing on understanding the impacts of climate change on urban water, sanitation and hygiene (WASH) systems. As part of HyCRISTAL, she is creating a tool or platform to guide the selection of cost-effective water supply and sanitation interventions that will reduce the total health burden for the area considered. Robert is a Professor of Hydroclimatic Modelling in the Department of Geography at Loughborough University. His research is on managing freshwater environments under climate variability and change, including reconstruction of drought and flood indices to assess the severity of recent extreme events. Current research explores smarter approaches to climate risk assessment and decision-making under uncertainty. On-going projects include seasonal river flow forecasting for hydropower plants in Central Asia. Ben is an Instrument Engineer at the Centre for Ecology and Hydrology, UK. He constructs, installs and maintains data-logging and telemetry systems using a wide variety of sensors for hydrological and micrometeorological measurements. He is particularly interested in measuring gas fluxes by eddy covariance. His work on the HyCRISTAL project concerns the deployment of a hydro-meteorological network in Kampala, Uganda, and a transect of climate stations in Kenya. He obtained his Ph.D. at Bangor University, assessing the distribution and persistence of viral contamination in shellfisheries. Xia is a Ph.D. candidate in the Department of Marine, Earth and Atmospheric Sciences at the North Carolina State University. She obtained her MSc. degree from the same university, focusing on the precipitation process over Lake Victoria Basin using a coupled limited-area atmosphere-ocean model. Within the HyCRISTAL project, she is investigating the drivers of asymmetrical rainfall pattern over lake Victoria. Read our news stories, below, for the latest information, or contact hycristal@leeds.ac.uk.